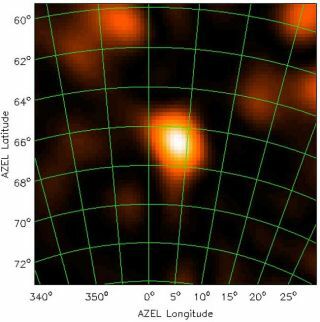 A false-color radio map of the sky above the LOPES experiment at the time of a cosmic ray hit. The bright blob in the center of the image is the radio flash, which lasts for about 30 billionths of a second. A small prototype array in Germany has detected several radio flashes from cosmic rays that smack into the Earth's upper atmosphere. A larger array, with more of these low-cost radio antennas, could help astrophysicists decipher the mystery behind the highest energy cosmic rays. Cosmic rays are high-speed sub-atomic particles - mostly nuclei and protons - that zip around space in all directions. Lucky for us, they cannot plow very far into our atmosphere before they collide with a gas molecule. From these collisions come showers of secondary particles - including electrons, anti-electrons (called positrons), and muons, which are like heavy electrons. Cosmic rays can be characterized by the showers they produce. Surprisingly, some of these space-faring projectiles have a 100 million times more energy than is possible in man-made accelerators. There are no "cosmic accelerators" in our galactic neighborhood that seem powerful enough to generate particles with this much energy. Therefore, these so-called ultra-high energy cosmic rays (UHECRs) presumably come from colliding galaxies or large black holes hundreds of millions of light years away. But that raises a problem: cosmic "stuff" along the way will slow - or even outright destroy - high-energy particles traveling these great distances. Added to this quandary is the fact that no one knows the true identity of UHECRs. The usual suspects are protons, heavy nuclei like iron, gamma rays, and weakly-interacting neutrinos. Sorting out the origin and nature of UHECRs is part of the impetus of the LOPES (LOFAR Prototype Station) experiment. This array of 10 low-cost radio antennas captures flashes emitted by a shower's electrons and positrons, as they interact with the Earth's magnetic field. The more energy in the initial cosmic ray, the more radio emission. "It is amazing that with simple FM radio antennas we can measure the energy of particles coming from the cosmos," said Heino Falcke, spokesperson for the LOPES collaboration. "If we had sensitive radio eyes, we would see the sky sparkle with radio flashes." Actually, our eyes would also need to be very fast, since the radio bursts only last a few billionths of a second. But during that short time, they are the brightest spots in the radio sky. LOPES picks up the flashes between 43 and 73 MHz - just below the FM dial. LOPES has not yet detected any flashes from UHECRs. To do so would probably require a larger set of detectors, since a square mile of the Earth's atmosphere is hit by an UHECR only once a century. Bigger radio arrays, such as the Low-Frequency Array (LOFAR) and Square Kilometer Array (SKA), are currently in development. But LOPES has helped in calibrating the radio flashes. This is because it is situated inside the KASCADE (Karlsuhe Shower Core and Array Detector) experiment, which measures the number of muons that rain down from cosmic ray showers. "This is indeed an unusual combination, where nuclear physicists and radio astronomers work together to create a unique and highly original astroparticle physics experiment," said Anton Zensus from the Max-Planck Institut fuer Radioastronomie (MPIfR) in Bonn. By comparing the radio flash to the muon count, scientists hope to eventually tell which of the suspected particles make up UHECRs. For a given radio signal, a proton - for example - would produce many more muons than would a gamma ray. The results are detailed in the May 19 issue of the journal Nature.